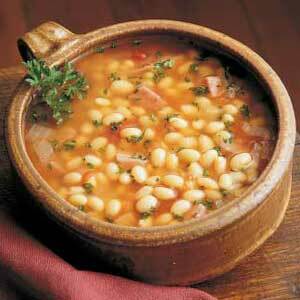 Traditional Bulgarian soup made from white beans and vegetables. You can add dry cured or smoked ham for a better taste. 1.Saturate the bean in cold water for at least four hours, then drain and pour fresh water. 2. Boil the bean in a pot with sunflower oil and fine cut carrot, celery and onion. 3. Peppers are added later. When the bean has turned tender, add the grated tomato, then salt and boil for another 20 minutes. 4. Serve sprinkled with parsley and pepper.